ADP-ribosylation factor (Arf) GTPases are a subfamily of the Ras superfamily of small GTPases. Arf proteins perform diverse and critical functions in fundamental cellular processes like membrane trafficking, lipid modification, cytokinesis and cell adhesion. Arf GTPases are tightly regulated by specific guanine nucleotide exchange factors (GEFs) with a conserved Sec7 domain, and GTPase-activating proteins (GAPs) with a conserved zinc finger domain. Like all Ras superfamily members, the GEFs switch on/activate Arfs while the GAPS switch off/inactivate them. However the distinguishing feature of Arfs is myristoylation at the N terminus, in addition to the presence of an N-terminal amphipathic helix that gets inserted into the membrane upon GTP binding. Once activated on membranes Arfs recruit their effectors which include coat proteins, lipid modifying enzymes and scaffold proteins (reviewed in ). The ability of Arfs to recruit a wide variety of effectors is attributed to the multiple membrane-protein contacts made by the Arf/effector complexes . The Arf family of GTPases comprises three different groups of proteins, mainly the Arfs, Arls (Arf-like) and SARs (Secretion-associated and Ras-related proteins)(reviewed in ). So far 33 genes encoding the different Arf family members have been reported (http://www.genenames.org/cgi-bin/genefamilies/set/357). There have been over 20 Arl proteins, 2 Sar proteins and 6 mammalian ARF proteins identified to-date. As well as regulating membrane trafficking, Arf family members are also involved in actin remodelling and cell adhesion. Arfs are primarily involved in the secretory, endocytic and recycling transport pathways. The Sar1 protein regulates transport of newly synthesized proteins from the endoplasmic reticulum (ER) to the Golgi complex. Sar1 regulates the assembly as well as membrane constriction and scission of COPII coated vesicles from ER . 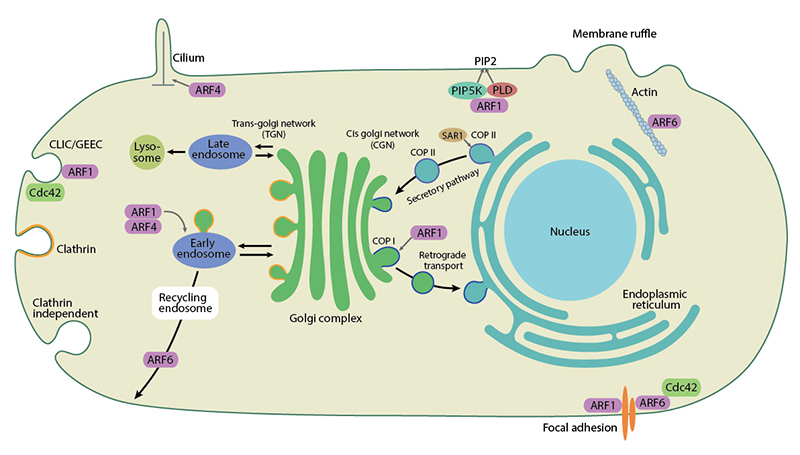 The ARF1 protein functions in retrograde transport from Golgi to the ER through recruitment of COPI coated vesicle proteins . ARF1 also regulates recruitment of clathrin through AP-1, AP-3 and AP-4 complexes as well as monomeric GGA proteins. Indeed, ARF1 has been shown to be indispensable for mouse embryonic development . 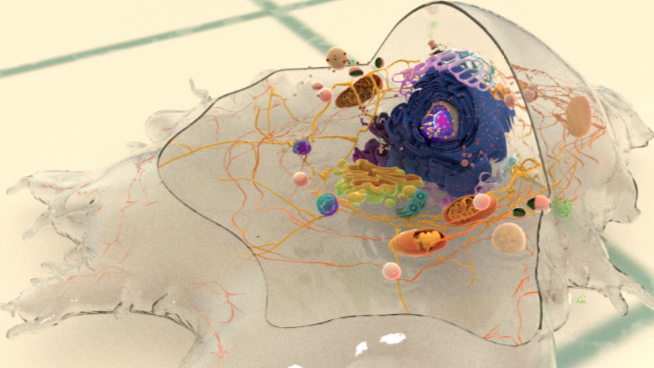 The ARF6 protein plays a major role in the endocytic pathway impacting cell migration, cell division and homeostasis . Other ARF proteins like ARF3, ARF4 and ARF5 also function at the Golgi and are found to function in pair with ARF1. The ARF1-ARF4 pair regulates retrograde transport from endosomes to the trans-golgi network (TGN), whereas the ARF1-ARF3 pair is required for the transferrin recycling pathway from endosomes to the plasma membrane . The Arl1p interacts with a guanine nucleotide exchange factor Gea2p and a flippase Drs2p to facilitate spatial modulation of membrane organization at the trans-Golgi network . All Arf proteins can stimulate the activity of lipid modifying enzymes like PIP5K and Phospholipase D. Arfs regulate the actin cytoskeleton, primarily through PIP5K and function at multiple stages of cytokinesis (reviewed in ). ARF proteins also function in the non-vesicular transport of lipids between organelles .